We’ve teamed up with Lamaze to offer five lucky mums-to-be three items from its Clip n Go range, perfect for on the go fun. The prize includes My Friend Emily, Pupsqueak and the Tug and Play Knot. Emily can’t wait to meet your little one and be a first best friend. From her crinkly hat down to her soft velvet feet, Emily has so many wonderful patterns and textures to encourage touch. 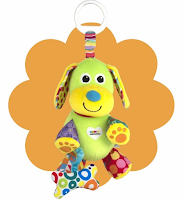 Baby’s first pet friend, Lamaze’s Pupsqueak, is multi-sensory fun to explore. Soft to touch and cuddly, with lovely bright colours, baby will love to look at all of the contrasting patterns on his paws and ears, perfect for encouraging eye development and tracking. Designed with development in mind. The Lamaze Gift Set would be for my baby nephew. I think he would love it. I would love to win this for my friend's little boy who is just over 3 months old. He is such a happy little soul. I would like to win for my very good friends who not long ago had a little girl. The puppy one is so cute! My brother and my 2 best friends are both expecting shortly, Lamaze toys were loved by our kids, they make great newborn gifts! I would love to win this for my friend for her daughter as i think she would love this. Id love to win for my newborn nephew. 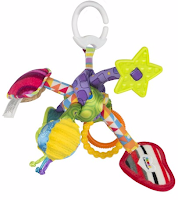 He is a few weeks old now and I love how he would benefit from the beautiful colours of Lamaze beautiful toys. Very ingaging! My youngest grandchild who is five months old and the three more who are expected in August, September and November this year! For my 2 month old son, we love Lamaze toys! Would love to win for my little niece Annie! She would love these! For my best friend whose baby is due any day now! I would love to win this for my niece who is expecting her first baby. A friend is expecting a baby boy very soon, and this would be a lovely welcome to the world gift. My sis. She's struggled to get pregnant and I'm so excited she now is! My little Girl Sofia :) I love Lamaze toys so bright and beautiful had loads of them for my son when he was a baby! I would love this for my baby due in Sept!! My friend who's baby is due in August. This is a great gift and I would feel really pleased to give it to her. I'd like to win for my niece, I'm sure she'd love it. The Lamaze Gift Set is perfect! Would love to give this to be niece! The gift set is for my granddaughter and I would love to win as they are so cute. I'd love to win this for my tiny new nephew, Luke. My best friend is due in one month so it will be for her little boy when he arrives! Lamaze toys are fantastic! My best mate is due her first baby in June, would love to give her this . My son, we love Lamaze toys, so much for them to discover. I'd like to win for my soon to be born great nephew, my little girl loved lamaze when she was little I they where my brand of choice for her to so I'm sure new mum & baby would love them too. This is for my new niece/nephew arriving in July. Want to help out my brother and sister in law who are just starting out. For my new baby neice! Lamaze toys are great! I would like to win this for my friends baby due at the end of May! I would love to win this for my daughter who should be here in a few short weeks! I would love to win this for my bubba to be (due August) - lovely newborn present/treat for both of us and a I've heard great things about Lamaze. this would be for a work colleague who has just gone on maternity leave to have her first baby. there is no special reason why i want to win except i like the buzz i get when i do win a prize especially the surprise ones where u get no notification from the competition provider but a nice parcel shows up on your doorstep. but fingers crossed for me and good luck everyone. It would be perfect for my sister-in-low who is expecting baby in August. If I won it would get put away for my best friends baby, she's due at the end of the year and I'm collecting as much as possible for my new god child! it would be for Marty and he has some Lamaze stuff already, has just been christened and I would love to give him a few more to add to his collection. I know someone who is due any time now. Can't say who because they've chosen not to post about the pregnancy online. This would be a great gift. My daughter liked her Lamaze products. My friend discovered she was 21 weeks pregnant last week, which was a bit of a surprise to say the least, so these would be for her. It would be a gift for my baby nephew. For my friend who is going to have her first baby this summer. We have two new models off the family production line in the last 6 months. 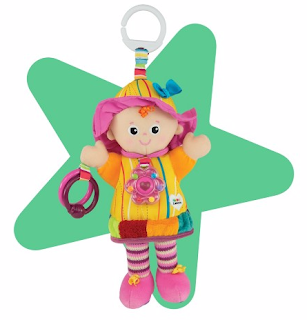 Both little ones would enjoy this lovely Lamaze item. I am due in September with my second 13 years after the first so not as organised this time round and really need to start preparations hopefully one of these will start me off !! I would love to win for a friend who is due in 6 weeks time. It would be a lovely gift for the new baby. My best friends just had a new baby and this would be lovely for them! I would love to win for my baby girl Elena Jade 8 weeks old today! I would love these for my little baby nephew would would have lots of fun with these. It would be for my eight month old daughter Grace, she already has one of your Lamaze pigs and really loves it so I'm sure she would love a different one to play with! For my nephew. Love Lamaze. Colourful, educational and always well made. A company you can trust. Its for a colleague work, who is absolutely lovely and has given me loads of her boyfriends old clothes for my son. The Lamaze Gift Set would be fantastic for my little nephew! We love Lamaze, would love to win for my best friends new baby boy. For new addition to extended family. She would have such fun playing with these toys.